After a loss to NC State and stunning loss to Boston College on Homecoming weekend this Louisville football team is at a crossroads. Heading into the season most expected a playoff run but now we might be lucky to make a Bowl Game. Poor execution on the defensive side of the ball and lack of a consistent rushing attack on the offensive side of the ball has their season upside down and this team will have to fix things fast if they want to play in December. I put in the leg work and followed this team through Fall and Spring workouts. I was excited about the offense and the defense. There was no way that I thought we’d be facing another three-game losing streak at this point in the season. I wouldn’t be fair in my critique of this team if I didn’t mention all the injuries to key players early on. The defense lost All-American Jaire Alexander after the first game and the offense has lost three key running backs in Jeremy Smith, Malik Williams and Colin Wilson. There aren’t many football programs that wouldn’t be affected by losses like that. Through seven games this season 12 true freshman, nine redshirt freshmen and one transfer have played for the Cardinals. As a team, the defense has been awful allowing 81 points over two games… Ranked #78 in passing yards allowed, #63 in Rushing defense, #72 in 3rd down conversion defense and #63 in total defense they just aren’t getting it done. I was excited to see a guy like Coach Sirmon come in and make things simpler. But I meant simpler for our guys to understand not simpler for the opposing offense to score on. The Sirmon defense hasn’t lived up to my expectations. Our guys have been more active but aren’t being put in the right spot to anticipate the play. And when they are in the right spot they aren’t executing the fundamentals. I don’t know if they track missed tackles, but they’ve had a lot of them. There has also been a lack of intensity from the defensive unit. Haven’t seen enough high fiving, chest bumping and jumping around from this group or their coaches. To get more intensity Coach Sirmon was moved from the box to the field during the last game. The team gave up 364 yards rushing. And there was little to no emotion while it was happening. We have had some great individual play on the defense. Jonathan Greenard is becoming a force off the bench. He has 11.5 tackles for loss ranking 10th nationally. True Freshman Dorian Etheridge is second on the team with 43 tackles and safety TreSean Smith has 17 tackles and four tackles for loss this season as a rookie. Trevon Young has made a triumphant comeback from injury and has registered 34 tackles, which is fourth on the team, and he is second on the team with 6 tackles for loss. Our defense has guys making big plays, but this team needs more of them and needs to learn how to execute a game plan together as a unit. There is enough talent here to win a big game, but will this group turn it around. The Louisville offense hasn’t been awful but not having a consistent rushing attack and lack of being able to establish those long time of possessions hasn’t done much to help the struggling defense. This Louisville offense is one of the best in the country. They are currently ranked #4 in the country in total offense and #7 in passing offense. But come in just #28 in rushing offense. And the only reason they are in the top 30 is because of Lamar Jackson. He has 690 yards and 10 scores on the ground. Having a 100-yard rusher a game like Jackson this team is hard to beat but add another 100-yard guy to this offense and they become really hard to beat. Coach Petrino has prided himself on running the football over the course of his career, and when the Cardinals can run the ball for over 200 yards, they are 45-6 with him as coach. Like I mentioned above the Louisville running back corps has been wiped out due to injury, but for this team to be successful going forward Coach P is going to have to find a way to get another running back not named Jackson in the box score. I love Reggie and think he can help here but he just isn’t that bruiser who can pound it out for those tough yards in the 4th quarter. That’s when this team needs long sustained drives and possessions to take the pressure off a tired defense. Hopefully Dae Williams can get it going and help down the stretch if not I don’t know where the answer is. I don’t know if they need to win the game on Saturday afternoon, but this team needs to play well and give themselves a chance to win. Going in and getting blown out wouldn’t be good and I don’t know if this team would recover from an outing like that. Florida State is 2-3 on the season, falling to Alabama, NC State and Miami with wins over Wake Forest and Duke. They have also had their fair share of bad luck this season, and their team is also at a crossroads of their own. There is still a lot of talent in Tallahassee and one of the most talented guys on their team is QB James Blackman. After losing their starting quarterback in the season opener Blackman has 799 yards, five touchdowns for the Seminoles and seems to get better every time out. He is a very effective passer with some talented WR’s to work with. Tops in receiving for the Seminoles is Auden Tate, who has 19 receptions, 312 yards and five touchdowns. And when it comes to a rushing attack you won’t find much better than freshman Cam Akers and junior Jacques Patrick. They have led FSU’s rushing offense to increase its rushing output in every game this season. Akers leads in total rushing yards (379-364), but Patrick has the edge in yards per rush (5.9-5.3). The Noles have set a season high rushing output in each of their first five games, while facing some of the top run defenses in the country and now they get a crack at Coach Sirmon. The Noles will be just a tough on the defensive side of the ball. Louisville a team that needs to establish a run game will face Florida State’s stingy rush defense allowing just 114.6 yards per game, a mark that ranks 21st nationally. Only one opponent has crossed 150 yards rushing against the Seminoles this season, as Alabama posted 173 in their season opener. Their defense had 12 pass break-ups against a top ranked Miami unit. The most for the Seminoles since 2008 and tied for the highest single-game total in the NCAA this season. Adding one interception, FSU’s 13 passes defended against the Hurricanes are the most in a game by an ACC team in 2017 and tied for the third-highest total in the NCAA this season. They have future NFL players all over the field on defense. Junior Josh Sweat has emerged as FSU’s most consistent edge rusher this season, leading the Seminoles in sacks (2.5) and tackles-for-loss (5.5). DB Derwin James has been everywhere this season. The preseason All-American leads FSU with 29 tackles this year. James is second on the Seminoles with four pass break-ups, and has 1.5 tackles for loss to go along with 0.5 sacks. James had five tackles and two PBUs in a strong performance at Miami two weeks ago, then followed by tying for the team lead with six tackles at Duke. After the last meeting between these teams you can bet that this FSU defensive group has been waiting for another crack at Jackson and company. I said that our Cardinals are at a crossroads but really both teams need to win this big mid-season match-up to carry some momentum into the rest of the year. I had high expectations for this season but now will just be happy to make it to a good Bowl Game and beat UK. 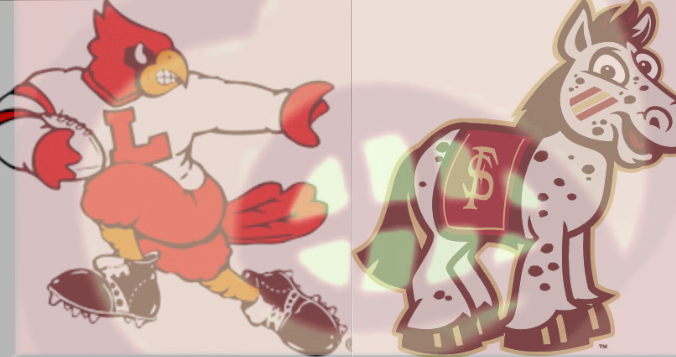 Both of those things may come into doubt if the Cardinals lay an egg in Tallahassee on Saturday. I’ve lowered the expectations but haven’t lost all hope. I think this group has a turnaround weekend and will finish the season strong. Enjoy the game folks. GO CARDS!